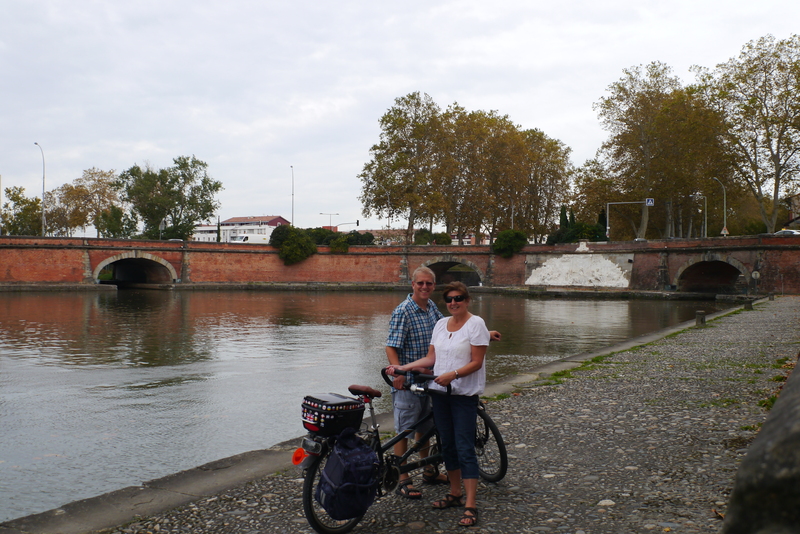 Since we arrived on the south coast of France in September we’ve been gradually cycling the Canal Du Midi (though it might better be described as the Canal du Muddy, or bumpy or windy in different places) from Sete to Toulouse. ‎ We’ve been waiting to finish the canal for weeks now and then yesterday, almost like waiting for a London bus, we managed to finish 3 canals in one day! Actually as we’ve had to cycle both ways we completed the Midi both ways in one day and the tiny Canal Du Brienne that connects the midi to the Garonne river as well. After all the wonderful scenery we’ve passed through en route, the picturesque locks along the tree lined canal, the finish of the midi in what is effectively a huge roundabout was to say the least disappointing. It’s been great fun cycling it though the french seemed to have perfected the art of making the wind blow towards you whichever direction you cycle, perhaps they do it because we’re English! To us completing it was a great achievement and deserved a celebratory meal! So we sat down in the central square in Toulouse which was all decked out for the marathon and got shouted at by a waiter, presumably as we wanted to buy something, and then had the menus flung in our general direction. Had my cricketing skills rusted up anymore then the frisbeeing menus would surely have decapitated a passerby. But in the way that only the English can master to show our anger we politely moved to a different cafe.‎ The French have a reputation for grumpy service and sadly we’ve found plenty of evidence of it on this trip. Cafes where the waiter just ignores you, shops where if you actually disturb the assistant by trying to buy something they look like you’ve just kidnapped their only child and heaven help you if you don’t have the right change, anything bigger than a 10 Euro note and you might as well be trying to pay with a bar of gold. Never mind, it’s actually quite amusing once you get used to it and quite entertaining too. Anyway, Toulouse . This is a gorgeous city and we’ve finally discovered the origins of the name. It is, unsurprisingly to do with toilets. Each resident has 2 toilets (2loos) one at home and then the emergency loo which appears to be any wall, tree, lamppost and if you stand still too long and you’re English the odd leg too. It really is a bit of a pongy city but quite stunning too ( not the pong). We’ve really loved it here . The centre is full of old buildings with balconies and gorgeous fronts, some lovely shops, churches parks and squares, bars and restaurants galore. It’s all very cycle friendly and has a hire scheme that makes Boris bikes look like a rip off. €5 a week or €20 a year! It’s also, unlike the rest of the towns we’ve cycled through, well kept and painted. We’ve tried to understand why the villages are what middle class brits would call “Shabby Chic” and we’ve taken to calling dilapidated and we think we have the answer. There are hardly any DIY stores. We stopped outside one for an hour the other day (we were having lunch, we’re not so sad we park up and watch DIY stores!) and we saw 2 people go inside, and neither of them came out with a trolley. Although come to think of it there is so much graffiti here that maybe they’re just all out doing that and don’t have time to paint their houses! But the difference between a town that last saw paint just before the Germans rolled through in their panzers and the beautifully decorated centre of Toulouse is quite astonishing. And most of the towns along the canal are of the same grand style as Toulouse, they’re just unkempt and have plaster falling off the walls and shutters rotting away and balconies rusting. But perhaps as people see what a coat of paint can do the effect will ripple out and make this area of France even more lovely than it already is. Our cycling has now become obsessional, and we both feel guilty if we don’t cycle each day! It has been just so glorious to get on Tilly and ride off each day along the canal‎. It’s so peaceful and relaxing and actually very English too – with sooo many Brits on boats and bikes – we’ve met some lovely people and had some great evenings with them too. Unfortunately the weather is now beginning to get colder and we had hoped to cycle from Toulouse to Bordeaux on the Garonne Canal ‎but we think this week it will become too cold and wet to continue, but fingers crossed and we’re going to try anyway.